Project out to tender to interested contractors. Funding applications continuing. SSE awards Thomas Telford Corpach Marina £100,000 from its Highland Sustainable Development fund. Several other grant funds are in the pipeline and we expect to have these confirmed as the summer progresses. Procurement work is underway and interested contractors with experience in this type of civil engineering are being invited to tender. Full details in our Press Release here. Sail Scotland Marine Tourism Conference comes to Fort William – 13 March. Our project managers NorthernLight, continue their work with several funding applications in hand. We expect to hear about the Scottish Government Regeneration Fund application before the end of February. Marine Scotland have provided Thomas Telford Corpach Marina with the necessary marine licenses for the construction of the floating breakwater and pontoons of the marina and the necessary dredging work. Through collaboration with West Highland College UHI, a student has been given the opportunity to undertake a work placement with the team at Northern Light Consulting. Euan Fundingsland, a second-year Marine and Coastal Tourism Student (BAHons), will be contributing to the Corpach Marina Project from December 2017 to April 2018. This opportunity will provide the student with valuable commercial experience in the industry relevant to the marine tourism sector, whilst providing the team with a new perspective on the project. This will trigger a supply of future students wishing to either gain experience through work placement or paid employment once the marina project has been completed. Thomas Telford Corpach Marina is actively working towards funding the project through various Government funding agencies. In October we successfully passed onto Stage 2 for the Scottish Government Regeneration Grant Funding. 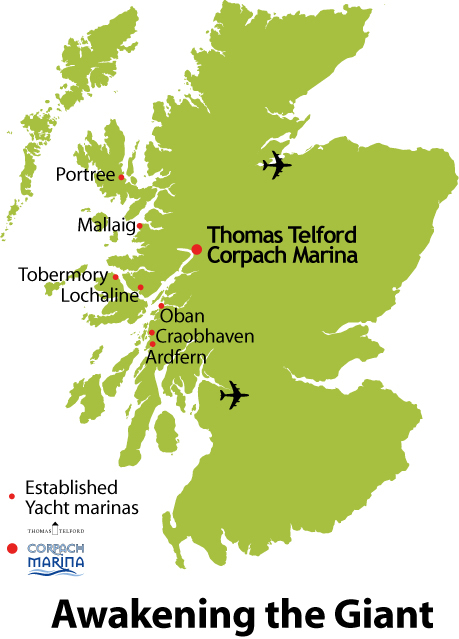 Thomas Telford Corpach Marina is working through the process of gaining a license to put the marina into the sea. http://wam.highland.gov.uk/wam/ – insert application reference 16/04706/FUL into the search box. The process to obtain a Marine Scotland licence for the construction of the pontoons and breakwater of the actual sea-based marina began a number of weeks ago and this will be progressing over the next 14 weeks. There will be further public consultations of the plans. Local company Northern Light, were awarded a contract by Caol Regeneration Company – Thomas Telford Corpach Marina in February to start the process of identifying sources of public funding from organisations such as The Big Lottery Fund etc. Northern Light will also be involved in the tendering process for construction contractors as the project moves forward. With funding from Leader a Scottish company Northern Light have been awarded a contract as Project Managers to lead on funding applications, to procure contractors to deliver the project and to oversee the delivery of all contracts within budget and on time. This contract commences on 1 February 2017. You can view our current marina layout here. Planning Application process is nearing completion and we expect to announce an outcome soon. Planning Application was lodged by our consulting engineers with The Highland Council on 17 October and should be available for public viewing in due course. Since the last update we have been consulting with more local residents and businesses in the Corpach area to discuss our plans. The steering Group met with Caol Community Council at their meeting on the evening of 17 October. Public Consultation in connection with a Marine Licence application to Marine Scotland. There will be a public consultation in Killmallie Community Centre between 3.30 – and 6.30pm. Members of the public and any organisations interested are welcome to drop in at any time during the period outlined above. The project continues to progress and we are now about to submit Planning Application to The Highland Council. Our designs and concepts have been modified to reduce dredging requirements and to reduce the size of the car park. The marina pontoons are now planned to be located further west and will be accessed by secured gangway from the car park. Detailed drawings of the rejuvenation of Scottish Canal buildings have been prepared showing a new reception, new office and mess for Scottish Canal staff, new toilets and shower facilities, a reception with small cafe and shop. The public slipway into Loch Linnhe has been carefully considered for all weather access into the sea. Preparatory work for the Corpach Marina project has been given a boost in the last month or so with confirmation of a £40,000 funding package; the project group are grateful to HIE, the Highland Council, Scottish Canals and The Crown Estate for providing this finance and continuing their commitment to our goals. We are now in a position to press ahead with applications for a Marine Scotland licence and planning consent, and have retained Arch Henderson, consulting engineers, to assist us in this task. During the winter, we have worked closely with Gael Force Engineering, a successful Highland company, to further shape our layout plans for the marina. Scottish Canals have also been actively involved in this process. The revised designs will take account of hydrographic and topographic surveys conducted last year, which demonstrated the need to move the floating infrastructure into deeper water. We have also received very helpful feedback from the Kilmallie Community Council and others which we are working to reflect in the new design, for example the scale of the project is likely to be smaller, with around 60 berths instead of 80. The public slipway will remain a key feature. It is our intention to consult widely on this final scheme in the very near future. The marina committee continues to meet monthly and to press ahead enthusiastically with the project. “There is no doubt that a marina by the Corpach Canal basin would be good for the local community, good for local boat users, and good for visiting yachts. Over the 20 years plus that we have been in business in Corpach, we have seen an increasing number of yachts visiting from Scandinavia and the continent on their way to or from the west coast. A marina would encourage more yachts to stay and visit Corpach and Fort William and use the facility for crew changes enabling visitors to join or leave a vessel in Corpach. For a number of years we have been attending yachts in the canal who are on transit and have encountered mechanical problems. A marina would potentially increase this level of business and enable us to offer a dedicated service to leisure boat users visiting or resident in Lochaber. Corpach Boatbuilding Company fully support the development of a marina facility in Corpach. We are submitting requests to a number of bodies, including HIE, for additional funding to take the project to a pre-construction fully consented stage. This is an essential prerequisite to the capital funding applications for a design and build contract. These have now been completed and the results have been assessed by our consulting engineers. Initial indications are that the original concept design, as set out in the 2011 Yachting Worldwide study, would mean very extensive rock and silt removal/dredging – at a cost likely to far exceed the original budget. In order to mitigate this, we are examining with Scottish Canals and Gael Force Marine whether the marina design can be altered with a move further out from the shore, possibly with a reduced number of berths. Pending the outcome of this critical work, our applications for Planning Consent and a Marine Scotland licence have been put on hold. A meeting has recently taken place with the LEADER project manager, Martin Culbertson, and we are clear on the timescales and approach for a funding application to support project management services. This process will begin next month with an Expression of Interest, and we are hopeful that an approval might be forthcoming by the late Spring of next year. We had a very positive meeting with Dave Thompson MSP and Ian Blackford MP, to inform them of our proposals and to seek their support as we move forward. In addition, we continue to ensure that the project is represented at the important Marine Tourism cross-party group, which meets quarterly at the Scottish Parliament under the chairmanship of Stuart McMillan MSP. This committee is the sponsor of the recently published Marine Tourism Strategy for Scotland, with which our project is an excellent fit. During the summer, tenders were sought and contracts let to firms specialising in engineering surveys. This work included mapping the hydrography and topography of the seabed and foreshore in the target area.